For many of us, a car’s like a second home. Yet unlike our houses, our cars take us to places where finding help in an emergency may not be so easy. Things can go wrong, but being prepared for that goes a long way toward giving you peace of mind. If you drive in areas or at times where calling for roadside service or getting a tow might not be quick or easy, then a spare time is a must. Most vehicles come with a small spare that’s sized to match the height of the car’s standard tires. Others come with a full-size spare that is the same size (and likely tread pattern) as the current tires. If you have the latter, it’s recommended that you include that spare in your tire rotation schedule so your spare has the same amount of wear as your other four tires. Along with the spare and jack, you should also know how to change your tire safely. Know where to place the jack, how to loosen the lug bolts, and how to tighten them correctly when the replacement tire is on the car. Find a knowledgeable friend or a mechanic and practice changing your tire in a parking lot or your driveway where it’s safe to do so. 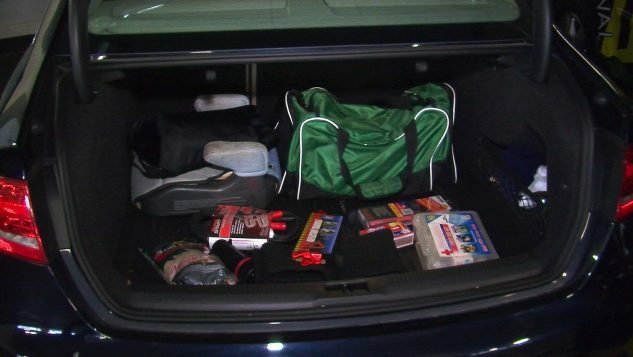 A well-stocked and comprehensive first aid kit is a good thing to keep in your glove box, trunk or under a seat. Your first aid kit should be a basic all-in-one kit with bandages, wet wipes or alcohol swabs, etc. Ready-made kits are available in plastic or canvas containers at most grocery, department and auto parts stores. If you’re not sure how to render basic first aid, you can see if your local YMCA, community center or hospital has classes available. In an emergency, having a way to signal other drivers to help minimize possible accidents is a must. Road flares or reflective triangles are made specifically for this. When your car is broken down on the side of the road, it’s important to let other drivers know it’s there, especially if you’re changing a tire or working outside of the vehicle. In some areas, it’s required by law. 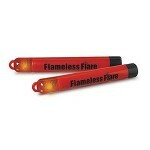 Road flares should be replaced periodically to ensure that they work properly when needed. The packaging instructions will give intervals for your particular flares. Every car should have a tire pressure gauge on board for emergencies. Some cars come equipped with built-in pressure gauges that give a readout in the instrument cluster. Tire pressure gauges are not expensive and they should also be used regularly to check the pressures of your vehicle’s tires for maintenance reasons. A portable tire inflation device, such as a 12-volt compressor, is a good thing to have on the road. A low tire can often be a problem that leads to worse problems. If you drive mostly in populated areas where service stations with air compressors are easy to come by, then a couple of dollars in quarters for those tire-filling stations may be an alternative. There are variations of these tools, but most look like small hammers with a metal end for breaking windows and a slit in the handle with a razor inside for cutting seat belts. These tools go unappreciated until they’re needed. Kept near at hand for the driver and passengers (if possible), this tool can help you escape your vehicle if it becomes submerged or is in a serious accident. Breaking window glass is very difficult without something to help and if a seat belt becomes crushed or blocked, it may not unclip or retract. When you’re stranded on the side of the road or have to replace a flat tire in the dark, nothing beats a flashlight. You may be able to count on your cell phone as a backup flashlight, but you can’t always guarantee you’ll have a good battery charge. A dedicated flashlight for the car is a better alternative. Sometimes emergency escape tools have flashlights in them, which can help consolidate your tools. It’s Murphy’s Law that we only seem to run out of windshield washer fluid when we really need it. Carrying extra fluid is a smart idea and very inexpensive to do. Keeping your washer fluid reservoir full is a must. A leading cause of accidents in inclement weather is poor visibility. If things go really south and you have to camp in your car for a while, a blanket is a hot commodity. Sometimes the weather is just too bad to drive in, and other times unforeseen breakdowns or temporary highway closures can mean hours of waiting in your car. A blanket helps keep you from burning a lot of fuel to keep warm and can keep you comfortable while waiting for help when your car won’t run at all. Jumper cables or a jump starter are things that many people need but don’t have. A set of jumper cables can help you when your car’s battery has been drained, and it can help someone else who may be in that situation. A jump starter is even better, as it’s both self-contained and limits the risk of accidentally making improper connections or vehicle voltage disparities. With either tool, knowing how to properly use it is also very important. Ask a knowledgeable friend or mechanic to show you how. Thanks, Meredith! Glad to hear you added the fire extinguisher.